I used it for the maintenance of a motorcycle. It is user-friendly. This review is about item#32695984. 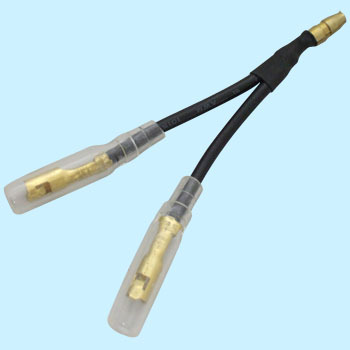 It is used for interruption of the vehicle speed sensor at the time of installing the slocon. It is more secure than caulking and interrupting with the included metal fittings. It was possible to install without problems. Compared to E company, it is cheap in cost and usability is fine. This is the best if there is a red line line instead of a black line. It saves the labor of manufacturing GOOD! Always with ACC and Illumi ... Every time we increase the number of electrical components, there is no interruption connector. Making is also better and better than I thought. This item is recommended. Although it was generally good, is there something a little longer, is it useful? Recently, even at home centers there are few electric buildings, so we are stocking several kinds of things with Monatarou. The product is satisfactory thoroughly. I use it instead of a one-touch connector that may cause poor contact. The old-fashioned Giboshi terminal is the most reliable. Used to take out power from existing wiring such as car. I had made a similar branch up to now, but it is convenient to save time and effort. GOOD ! !